In chemical bonding there are different types of bonds formed between two or more atoms. A covalent bond is formed when the electron pairs are shared between two atoms. The number of electron pairs that are being shared can vary from atom to atom. If the atoms are sharing one pair of electrons then a single bond is formed, for the atoms sharing two pairs of electrons the double bond is formed, and the atoms sharing three pairs of electrons a triple bond is formed. The first step to towards understanding the Covalent bond formation is identifying the number of valence electrons for the given atoms. The valence electrons are the number of electrons in the outermost orbit. The electronic configuration of the atoms is written to identify the valence electrons. According to the number of valence electrons the covalent bond is formed. 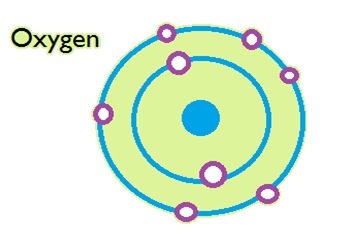 Hence the oxygen atom has 6 valence electrons. The covalent bond is formed so that the atoms achieve the stable state configuration. The Stable state is usually when the atoms have 8 electrons in the outermost orbit. There are few atoms in the periodic table which already have an octet. This means they do not need to form any kind of chemical bond to achieve the stable state. Amongst such atoms are Ne, Ar, Kr and so on, these are called the noble gases. As mentioned the covalent bond is formed by sharing the electron pair. There are two types of covalent bonds the polar covalent bond and the non-polar covalent bond. The polar covalent bond is formed when the atoms share the electrons unequally between each other. This results in partial positive and negative charges on each atom. The non-polar covalent bond however has equal sharing of electron pair between each other. Mentioned below are the examples of the compounds formed due to the Polar Covalent bond. The compound Hydrogen Fluoride HF is a formed by the polar covalent bond. 1. The electrons are being shared between Hydrogen and Fluorine atoms. 2. The first step is to write the electronic configuration of each Hydrogen and Fluorine atoms. · Hydrogen atom has one electron in the outermost orbit. So the number of valence electrons is one. Hydrogen will need one more electron to reach the stable state. 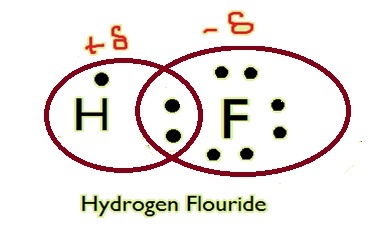 · Hydrogen and Fluorine form a polar covalent bond by sharing an electron pair. · The shared electron pair is pulled more by the Fluorine atom because of which it obtains the partial negative charge on it. · The Hydrogen atom get the partial positive charge, due to the unequal sharing of the electron pair. · These charges on the atoms result in the electronegative difference between the two atoms during the formation of the Polar Covalent Bond. Follow another example, for the Polar Covalent Bond formation in the CO2. 1. There are two atoms of oxygen and one atom of Carbon forming one molecule of Carbon di-oxide CO2. .
2. The first step is to write the electronic configuration of each Carbon and Oxygen atoms. · The Carbon atom has 4 electrons in the outermost orbit. This means the Carbon atom needs four more electrons to reach the stable state. · There is a double bond formation between the carbon and oxygen atom, which means the carbon is sharing two pair of electrons from each oxygen atom. · Since there are two oxygen atoms, there are four bonds formed and Carbon is able to achieve an octet. · The oxygen atoms have high electronegativity due to which the carbon is obtaining the positive charge and the oxygen is obtains the negative charges. · Due to this uneven distribution of the charges the bonds formed are polar covalent bonds.